The black metal and thrash strands coiled together in the musical DNA of Ground of Ruin synthesize some fine, clearly-expressed riff proteins on the Cloaked in Doctrine EP. There's little of the messiness or recklessness often associated with blackened thrash. 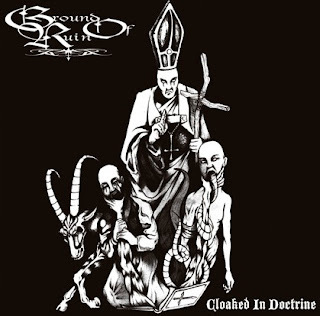 Instead, we get well-wrought guitar lines that sometimes hint at Ground of Ruin's Irish homeland, and lyrics that avoids Satanic claptrap in favor of more direct critiques of religion ("Crusade of conviction, castration of instinct / Repressing impulse, slowly grinded away"). Vocalist Dave Hynes states a familiar case, but he does so with uncommon pithiness, and a bevy of different ways of eroding the lining of his esophagus. Ground of Ruin - "Cloaked in Doctrine"
The clarity of the riff-writing and sound are impressive on this EP -- the guitars feel live, their players in complete control. Once this band has a couple more albums under its studded belt, the songwriting will likely follow suit. As of now, Cloaked In Doctrine feels like three looooong strings of good riffs (plus an unnecessary intro track) without much of a carrot pulling us along, just Hynes' death shriek telling us we can't stay where we are.